MONTREAL - Members of the media covering the Montreal Canadiens selected forward Steve Begin as the winner of the Jacques-Beauchamp Molson Trophy, awarded annually to the member of the Canadiens who played a dominant role during the regular season, without obtaining any particular honor. Begin, who is completing his seventh NHL season and his second with the Canadiens, had his name cast on 49 of the 51 ballots. 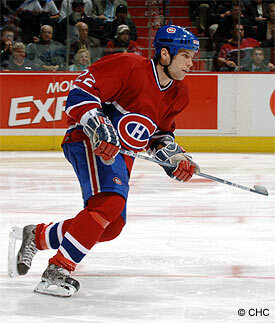 In the voting, he finished ahead of defensemen Craig Rivet and Francis Bouillon, the 2003-04 recipient of the award. Rookie forward Chris Higgins finished in fourth place. A native of Trois-Rivières, the 27-year-old centre established career-highs in 2005-06 in games played (76), goals (11), assists (12) and points (23). Begin leads the team with 202 hits, a total that ranks him fifth in the NHL. He is also in second place on the Canadiens with a plus/minus rating of plus-9 and two shorthanded goals. Created in 1981 to honor the memory of a sportswriter who spent most of his professional career covering the Canadiens, the Jacques Beauchamp-Molson Trophy was first awarded to Doug Jarvis at the end of the 1981-82 season. Through the years, Craig Ludwig (1982-83, 1984-85, 1985-86) and Mike McPhee (1987-88, 1989-90, 1990-91) won the award three times each, while Benoit Brunet received the Trophy on two occasions (1994-95, 1998-99).